Not many have pondered upon this story from such a unique point of view and not much attention has been directed towards the wife of the Biblical character Job, except the usual scorn directed her way. 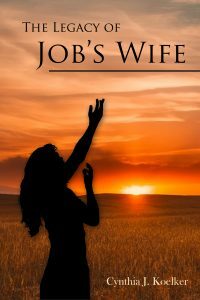 In The Legacy of Job’s Wife, Cynthia Koelker tries to understand her urge to ask Job to curse his God. Koelker crafts a heart-warming Christian fiction story filled with charming romance. Possibly it was the mesmerizing eyes, their delightful friendship or her gift in music that made Job fall in love with Ix’ises. From their childhood years, they were inseparable. Unfortunately, they did not share the same faith and Ix’ises struggled constantly to understand Job’s faith and God’s relationship with mankind. Still, Ix’ises and Job’s love for each other grew steadily. Like many other love stories, it was not without its challenges as Job became distanced with Ix’ises while working for the magistrate of Uz. Fortunately, they found each other once again but untold tragedy was to strike swiping away everything they had. The Legacy of Job’s Wife contains vivid moments told through heart-warming descriptions. Every detail is well-designed to help paint a picture in the reader’s mind. From the terrain, the cuisine, the culture, and the architecture, Cynthia Koelker must have carefully considered different aspects when coming up with the story. The tale also tallies to the Biblical account in many aspects providing a deeper understanding of the actions of Job’s wife. Ix’ises anguish on losing her children is made tangible through Koelker’s powerful descriptions and her ability to narrate. The idea behind the book is quite unique. Not much has been written on Job’s wife and what is available is somewhat shallow. It was interesting to look into the story closely through the eyes of Job’s wife as opposed to the common point of view. Certainly, the anguish she felt at the time upon losing her ten children, would have driven her to lose all possible faith that had remained in her. Further, The Legacy of Job’s Wife points to man’s desire to understand God’s actions and the devastating nature that painful events have on faith. It also points to God’s mercy as He restored Job and his family giving them twice what they had lost. All these themes appear in the story which makes the book even more enlightening. There are few to none grammatical errors in the book which helped maintain a grip on me and also made reading easy. The Legacy of Job’s Wife by Cynthia Koelker is a wonderful book that every fan of Christian fiction with strands of romance will appreciate. I rate it 4 out of 4 stars.